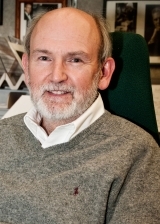 Gary C. Schoenwolf, Distinguished Professor of Neurobiology and Anatomy at the University of Utah School of Medicine, was awarded the 2019 Society for Developmental Biology Viktor Hamburger Outstanding Educator Prize for his outstanding contributions to developmental biology education. Schoenwolf has a long-distinguished career studying morphogenesis and neurulation in chick and mouse embryos. Today his work focuses on understanding the signaling pathways that underly inner ear development. For the past forty years while actively engaged in research and teaching, Schoenwolf has authored numerous editions of three textbooks that have trained generations of undergraduate, graduate, and medical students. His Atlas of Descriptive Embryology features detailed illustrations of development across diverse organisms and Laboratory Studies of Vertebrate and Invertebrate Embryos is a laboratory guide to embryology. His 5th Edition of Larsen’s Human Embryology, a medical textbook focused on the clinical applications of embryology, was recognized by the British Medical Association’s Medical Book Awards as Highly Commended in the Basic and Clinical Sciences Category. Schoenwolf takes a developmental anatomy approach to teaching developmental biology. He always puts the molecular data in the context of developing organs and organisms. For ten years, Schoenwolf served as Editor-in-Chief of Developmental Dynamics. Early in his tenure, he expanded the scope of the journal to not only cover vertebrate development, but all developmental systems. He also negotiated the broader distribution of published expression patterns into model organism databases like GEISHA (chick), Xenbase (Xenopus), and the Jackson Labs (mouse). The developmental biology community continues to benefit from the beautiful posters of development the journal publishes. Schoenwolf is an Elected Fellow of the American Association for the Advancement of Science and a Fellow of the American Association of Anatomists (AAA). He received the Henry Gray/Lippincott Williams Wilkins Scientific Achievement Award from AAA in 2009 and the AAA/Wiley A.J. Ladman Exemplary Service Award in 2011. Schoenwolf served as Secretary of the Society for Developmental Biology from 1997-2003 and has led many educational, mentoring and grant writing sessions at SDB meetings and most recently the 7th Boot Camp for New Faculty. He will present his Viktor Hamburger Outstanding Educator Prize lecture at the SDB 78th Annual Meeting in Boston, MA, July 26-30, 2019.